I recently attended the 21st National Metropolis Conference in Halifax (you can view most of the presentation slides from sessions). I don’t get to these gatherings very often and they’re always a reminder of how much is happening in a very complex sector and how awesome and committed sector folks are. I presented a summary of some research work I’ve been doing for a client, and thought I’d share my presentation notes here. PeaceGeeks is a nonprofit organization that builds digital tools to empower communities in the pursuit of peace. Since 2011, they have collaborated with communities to put technology tools and digital literacy in the hands of citizens, peacebuilders, human rights defenders and humanitarian responders. PeaceGeeks operates on the principle of inspiring local action to solve local problems, with a vision to make peace a lived reality for everyone. They’re currently based in Vancouver, Canada and Amman, Jordan. Arrival Advisor is a free mobile app built and recently launched by PeaceGeeks to help newcomers settle in B.C. Arrival Advisor offers users trusted information and content as well as referrals to relevant services that they need. Arrival Advisor is free, anonymous, and currently available in English, French, and Arabic. The app will be available in Korean, Chinese, Punjabi, and Tagalog on July 1st. Content comes from the Welcome to BC guide/website and service directory information comes from BC 211. They’re not duplicating existing resources, which I think it important and means the app can scale to other provinces. PeaceGeeks built Arrival Advisor for the British Columbia context and is excited to seek opportunities to scale the app to other provinces in Canada. PeaceGeeks has received IRCC funding to develop a strategic vision and action plan for exploring how technology and innovation can best support settlement outcomes for preparing newcomers. 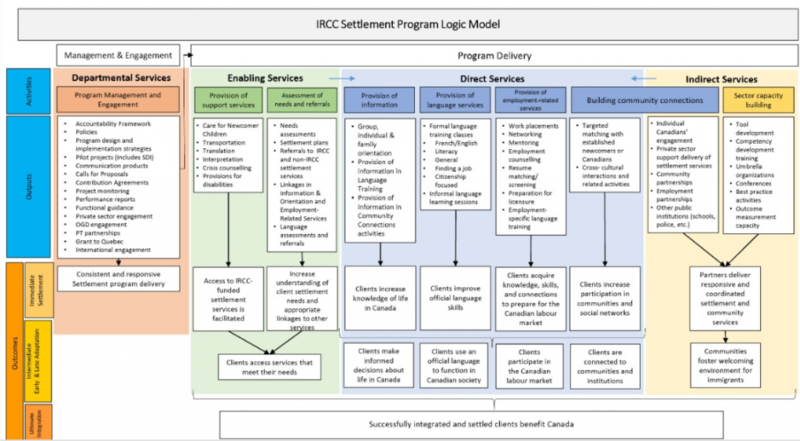 The intent is to provide a vision for a broader Settlement 2.0 future that prioritizes empowering newcomers to be agents in their own settlement journey and which builds the overall capacities of the settlement sector to successfully resettle newcomers by embracing innovation. 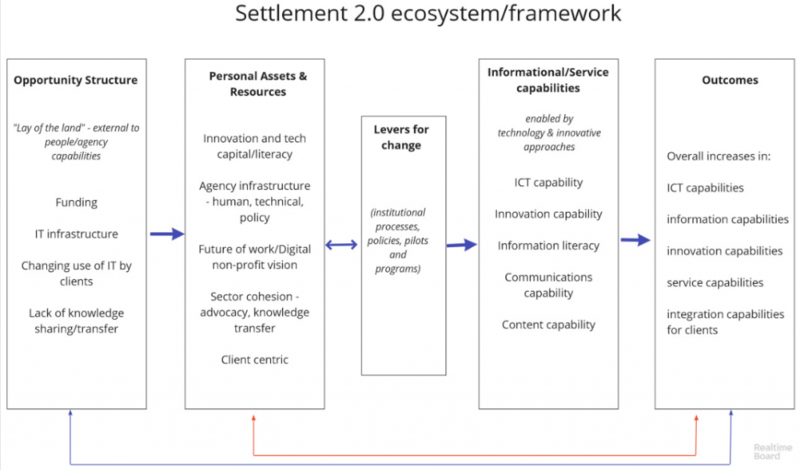 delivery models, as well as barriers to open and collaborative innovation in the settlement sector. clients, how do we get there? We’re currently looking at the state of the sector now, the “opportunity structure” through interviews and a literature review. We’re looking at what assets and resources the sector has, but also what capabilities and resources it needs in order to get to the outcomes we want. … but this is what it will look like to get there. It’s messy and complex, just like our sector. Before we move forward though, I want to remind us of where our roots are. Almost 20 years ago the sector agreed to some core values (the 12 Core Values of Settlement Work). You may not know about these, but they ground our sector in community and newcomer-centric approaches that value collaboration, the currency of information, being accountable to our communities, and recognizing that the sector is not just a service industry, but an agent of change in our communities and clients’ lives. But we’ve lost our way a bit and too many people in the sector aren’t aware of this rich history. It’s worth noting that the language being used today to describe innovation – client-centric, co-creation, open, transparent, empowering communities, addressing vulnerability, knowledge sharing – is language that our sector is rooted in, as are approaches to service provision, program development and system change. 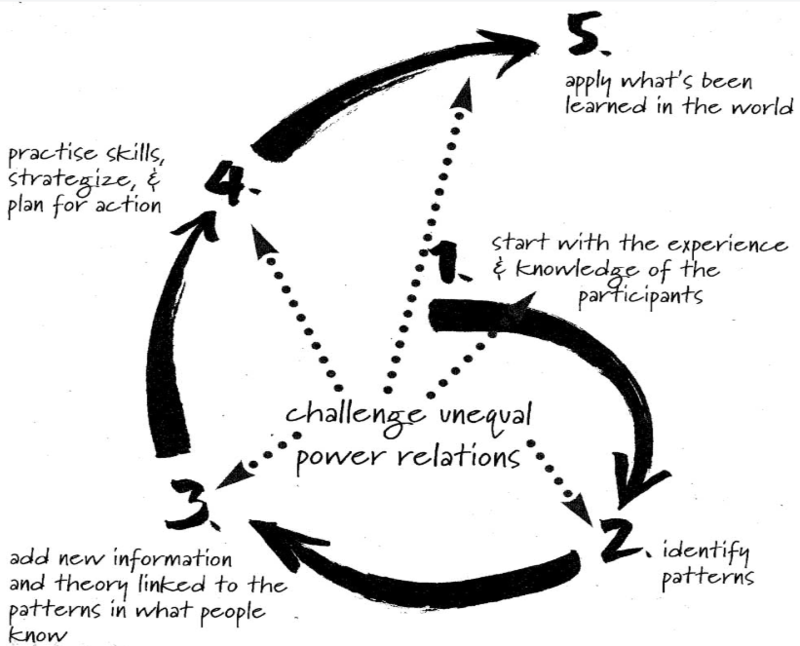 When I started working in the sector, program/project development and community engagement looked like this (the Spiral Model of learning, from popular education theory and practice). So, where is the sector at now? In this conference I’ve heard people talk about wanting to shift the language about clients from having needs and deficits to having assets and aspirations. That conversation needs to shift between the sector and its main funder as well. Like every other industry dealing with what’s being called the Fourth Industrial Revolution, it needs resources, time, space and support to innovate. This is the funding model you’re working in now. It’s complex and multifaceted. And for multiservice agencies with multiple funders, it’s only one of the models you work within. 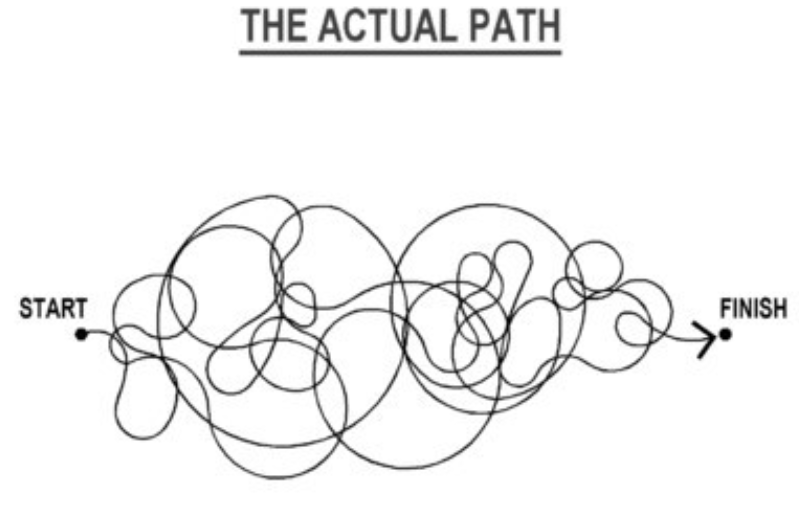 This is your operational reality. 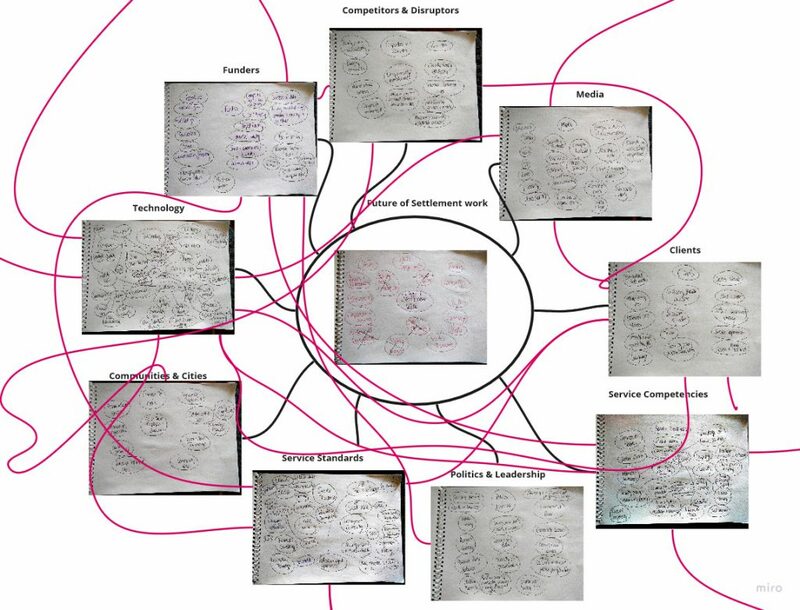 It looks complex and messy and inter-connected and overwhelming. There are many moving parts. There are many actors, and the complexities and actors are only increasing. It gets even more complex when you drill down into each area. And I likely haven’t identified all the high level, let alone the specific areas in each section. But let’s drill down into just one aspect, that seems on the surface, so simple – digital instant messaging – it reveals additional complexities under the surface. These complexities point to additional resource and capacity needs. It’s not much better for our clients. Their reality is also one of complexity. Problematically, there are too many people in the sector that compile their own service directories, rather than strengthening the 211 system. Relationships with 211 service providers are inconsistent across the country, and perceptions of 211 usefulness are mixed. That has contributed to information fragmentation and system navigation challenges. So if we’re looking at high level trends, challenges, barriers, but also promising practices and opportunities, what is the current lay of the land? Does sector collaboration “spark joy?” Well, no. One of the areas that comes up consistently is the desire and need to share knowledge, information and resources focused on promising and emerging practices in the sector. We have to be strategic in our technology choices, and decisions, and not go for the bling of new technology. 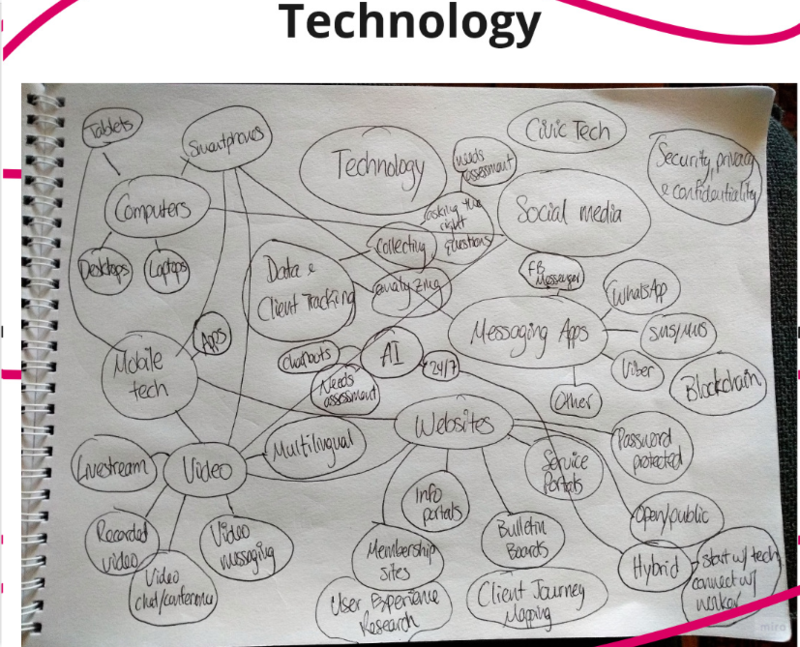 Below the technology iceberg are a lot of challenges and processes to make what’s above the iceberg work well. We need more work done below the surface. As Louisa Taylor put it yesterday, strategy before tactics. The sector uses technology, has a rich history of being innovative with technology. But it’s fragmented, inconsistent and not sector-wide. Feedback to IRCC for over 20 years has been pretty consistent: we need adequate resourcing, professional development, time, collaboration with experts and flexibility to iterate, fail, learn and innovate. We collect a lot of data and information about our clients. But we don’t use it strategically in our agencies. It’s for output reporting. That’s a problem. But even if we wanted to do more, we don’t have the expertise. If we do, it’s someone doing it on the side of their desk. A common theme. … they are also creators. They’re making, solving, networking, bypassing us (most studies show that about 60% of newcomers don’t access services – at least half of those don’t know about them). The networks are increasingly private, which means our ability to reach potential clients might become more difficult, at a time when they need us the most. They rely on informal networks and supports. The evidence shows us that informal supports, while more heavily accessed, simply do not provide the outcomes newcomers need. We need to be there, where they are on line and with technology they use, just like we would be offline, in their community spaces. To have the capacity for a Settlement 2.0 vision, we need resources, support, different funding structures and relationships, trust, space, and time. Trust, space and time comes up time and time again in this conversation. So do capacity and resources. Agencies have to have the re- or up-skilling as well as hiring new types of roles and staff in order to move forward. It will mean more resources, not fewer initially. The lack of standardized professional development/competency frameworks across the sector and at all levels in organizations (from front-line to ED) is a huge issue. It will only get bigger. There are many. Some have been around for a long time, some are newer, some are emerging. We need to identify and share them. Not just “best practices,” but promising, interesting, emerging, ideas to watch. And we need to share them and connect with each other, confident that our sharing is collaborative, not fearing competition. We share amazingly at conferences like these, but if you’re not here, you miss out. And even here, the sharing is bite size, and ultimately overwhelming. We need to figure out how to better share and learn together. I know you know all this. There’s a sense that this conversation happens all the time and things don’t change, or change very slowly, but with increasing expectations from the funder that things will change without the supports and resources identified by the sector and other actors. If we know what the lay of the land is, and we know what assets and resources the sector has, but also needs to develop the capabilities to achieve the outcomes our clients want, what are the levers for change that will get us there? There are approaches, promising and emerging practices that we can learn from to help get us there, including from other sectors, but they need what Maytree’s Alan Broadbent has called the Three I’s of Integration – Investment, Intentionality and Instruments. Otherwise we are building innovation and technology systems on top of a shaky, broken table foundation that’s missing a leg and will collapse with the added weight of innovation and technology-use expectations. It will take resources and some small steps together with funders, clients and communities and in-sector collaboration to get there. Broadbent has also said after we identify the problems, the hard work is to craft the solutions. Why? Why might things change this time? Service Delivery Improvement funding – they’re throwing a bunch of new ideas against the wall to see what sticks. The results of these projects will help bring evidence-based information into the Department. The rest of the sector needs to push their evidence as well. The current evidence shows us that the sector has the capacity, but needs the resources. We can get there. Innovation practices and labs are emerging in the sector – LIPs are making collaboration happen in places where it’s been a historical challenge, WoodGreen Community Services Innovation Lab, MCIS Language Solutions, NouLab’s Economic Immigration Lab, SFU’s Radius Refugee Livelihoods Lab, Refugee Career Jumpstart, and many others who have been recently funded that work from this type of experimentation mindset and framework. Then there is innovation in government. All three levels of government have embarked on digital/innovation overhauls of the way they serve the public, with the first common element to think of the client first and have them in mind when creating or revamping anything they do. They have created innovation labs (did you know that IRCC has a Client Experience Branch with multiple teams totalling 66 staff? ), developed Digital Service Standards and at the federal level, have created a Digital Academy – “The curriculum offered at the academy will support all levels of public servants in their efforts to modernize operations to deliver the kind of digital services that Canadians expect.”). If they can do it, so can we. The sector wants this. New actors, like innovation labs/civic tech types and newcomers themselves, are going to build it anyway. I think we’ve got 5 years to start taking those small steps together so that when the next CFP rolls around, the way we approach, fund, implement and deliver services can start to look different from how we’re doing it today. As Broadbent might say, we have the hard work of crafting solutions ahead, but the evidence suggests that the sector can build solutions in collaboration within and with funders and partners outside the sector as well. In case they’re of interest, here are my presentation slides. 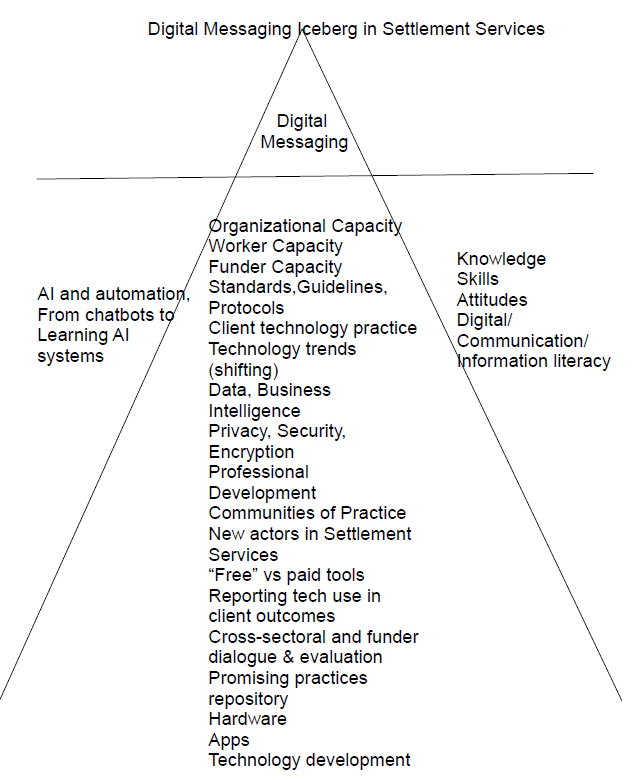 This entry was posted in Nonprofits, Online Service and tagged cdnimm, digital capacity, digital literacy, futureofwork, innovation, nptech, online. Bookmark the permalink.